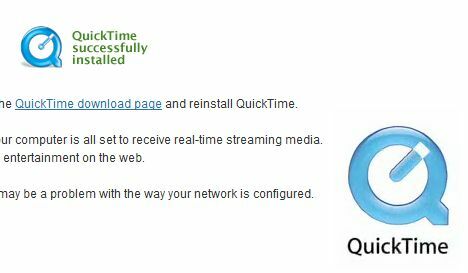 After installing Apple QuickTime, it’s essential to test the QuickTime installation to verify and ensure that the QuickTime is installed properly and worked as desired. Testing allows you to playback any streaming video or HD (high definition) movie contents immediately embedded on web browser or downloaded without delay or having to spend time troubleshoot the QuickTime codec or decoder again. It’s also useful to test if there has been issues with QuickTime installation. To test QuickTime, browse to QuickTime Troubleshooting page (http://www.apple.com/quicktime/troubleshooting/) using any standard web browser such as Internet Explorer, Mozilla Firefox and Opera. If the QuickTime is working properly, you will see a QuickTime Successfully Installed message embedded in QuickTime .MOV video, and a prominent QuickTime logo. If you don’t see any blue color QuickTime image, it means the QuickTime is not installed correctly, installation has failed or is not installed, and you probably need to uninstall any instance of Quicktime, re-download and reinstall it. Note: QuickTime is no longer supported by Apple for Windows, but is still bundled with in macOS.